What's the Germiest Place in Your Kitchen? 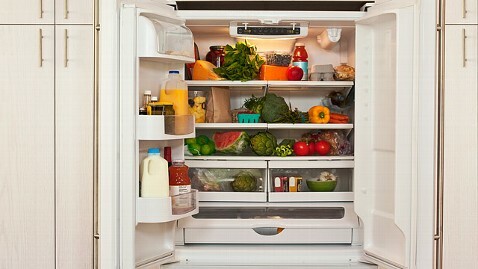 Next time you open the refrigerator to grab a tomato or a head of lettuce, you might want to give them an extra good wash. A study from NSF International revealed that your fridge's veggie drawer might be the worst host of bacteria and germs. Most people "don't think that vegetables are that much of a problem," said Lisa Yakas, microbiologist and manager of the Home Products Certification Program for NSF International, a nonprofit organization that develops public health standards. To clean up, Yakas suggests washing the bin with warm soapy water and deodorizing with a baking soda mixture if needed. "I'm a mom … so this is something that I think about when I'm at home in my kitchen. You know, how can I protect them?" said Yakas. Most parents expected the microwave to be the worst offender. "A lot of people said the keypad on the microwave," she said. But since it's a smooth surface, bacteria is less likely to grow. "Everybody's touching it all of the time, but they probably clean it more often," she said. The study showed that the blender gasket was another unclean place. Most people don't take the time to separate and individually wash the blender pieces, so they're gunky. Think the can opener doesn't need to be cleaned? Think again. "This is another area that people just aren't thinking about it. People just toss it back into the drawer. Food particles can build up and get dried. After using it, clean it off, use a sponge or cloth," said Yakas. If your kitchen isn't spotless, don't panic. "We're not trying to scare people," said Yakas. She recommends that people get on a regular cleaning routine once they've washed the worst areas.